Yes, Halloween has finally arrived!!! Soon there will be happy costumed children ringing your doorbell anticipating some great candy treats. Our childhood memories are great . . . and those we shared with our children . . . and grandchildren . . . New memories can be made every day . . .
We are truly blessed with holidays and different celebrations . . . as long as we don’t allow the outside world to get under our skin. The news always seems to be doom and gloom . . . but it doesn’t have to get you down . . .
There’s this board game by that name . . .
I’m sure I’ve reviewed it, but there’s a newer edition and lots of other additions to it that I thought I’d share with you. It’s not necessarily a Halloween game, it works for all seasons . . . It’s just a way of putting gloom and doom in perspective . . . to have fun with it. This game isn’t for everyone, but it’s always fun when I bring it out for family game night. In this game you will meet an eccentric family of misfits and assume the control of their fate. The goal of the game is both sad and simple — you want your characters to suffer the greatest tragedies possible before they die. But you will be cheering your opponents’ characters with happy occasions. Does it seem to be a game you, your friends and family would enjoy? Like I said, it’s not for everyone . . . it’s designer is Keith Baker. This second edition has improved the packaging, rules have been fixed, there are timing icons, reminder cards and so much more. It is compatible with the first edition game and supplements. Gloom is recommended for ages 13 and older. The game involves 2 to 5 players. It takes about an hour to play. I do like the game . . .
You may like these supplementary Gloom expansions to bring more . . . mishaps to your game night . . . pleasure . . .
Well, there you go! The wonderful world of Gloom. Believe it or not, there are Gloom fans!! It has its own appeal . . . If you’re looking for 3 hours of Halloween sounds . . . I have a YouTube video to share. It pretty much creeped me out after a few minutes. I’m sure you can handle it a bit longer . 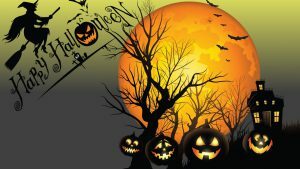 . .
It’s great background for your Halloween celebrations . . . I hope you enjoy this video . . . It may be relaxing for you while you’re reading a book to relax . . . and maybe not . . . .
Have fun . . . Happy Halloween!!! 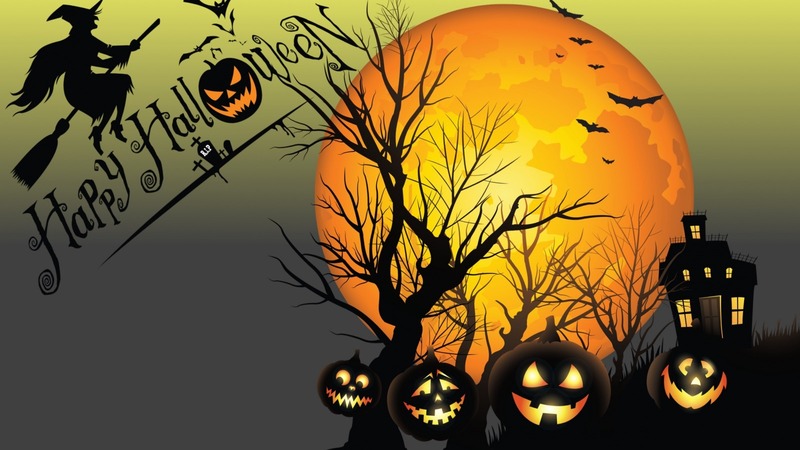 Halloween is a fun event for young and old alike. I just needed to add my favorite YouTube video of Monster Mash! It was quite a sensation when it came out in 1962. And I still love it and will share it here every year . . . Your guests may enjoy dancing to this catchy tune at your Halloween Party . . . and it’s all right for kids, too. The fun thing is that it is still popular after all these years . . . I’m surprised there haven’t been more fun Halloween hits . . . Sure, in movies . . . but in music? I remember buying one of those creepy Halloween sound CDs . . . it was creepy all right . . . At first I thought it was kind of goofy with the rattling chains . . . the blowing wind . . . the screams . . . and then after awhile, it did get my imagination going . . . and I had to turn it off . . . It started to scare me!! Come to think of it, I haven’t played it since . . . I may need to dig it out . . . Where did I put it? However you plan to celebrate this great weekend of Halloween fun with your family and friends . . . I hope The Monster Mash will be part of your musical selection . . . it is a definite toe tapper. Is it possible for a healthy smoothie to taste like your favorite candy? Smoothies are popular . . . healthy . . . and sometimes not all that delicious . . . The whole idea of having a healthy smoothie is to drink it . . . so it has to taste good . . . otherwise it’s healthy without fun. And we all like to have something to look forward to . . . not hold your nose and gulp something down . . . because it’s good for you. Well, Tyler Cordell, the author of Crazy Candy Smoothie Cookbook: Healthy and Heavenly Smoothies That Taste Just Like Your Favorite Candy puts the fun into smoothies!! This recipe book has 30 delicious smoothie recipes that taste just like candy . . . Laffy Taffy is one example — Banana or Strawberry . . . and I’m sure you can also ad lib a bit with your smoothie and have both in one drink to tickle your taste buds into a happy taste sensation that is healthy. For chocolate lovers . . . there’s a Snickers Shake . . . and other chocolate flavored smoothies. I love the title of this recipe book and the cover picture grabbed my attention. I immediately thought of healthy treats for the kids . . . and one reviewer of this book mentioned how these smoothies are a substitute for her candy addiction. That’s a good thing, right? Click the image to the right and you’ll be able to take a look inside this book. I was watching some movie the other day and one scene was about a juice bar and how people ordered their drinks . . . some from the menu and others were their own combination . . . kind of like people do with their coffees . . . This got me thinking of looking for crazy recipes for smoothies . . . and I’ll need to figure out the coffees, too. No one likes having a boring drink . . . or food for that matter. Click any of the images above to be taken on a healthy adventure into good tasting and maybe a bit crazy food and drink recipes. It’s all about enjoying your food and drinks . . . sharing them with friends and family . . .
I’m sure you’ll find something to brighten up your life a bit . . . and find it healthy and nutritional, too. Have you ever thought of something about yourself and then someone else says something similar to what you thought, but in reference to themselves? Yesterday I was talking with a couple of my internet marketing friends. Out of the blue he made a reference regarding the direction he wanted to focus with his on-line business. Everything he said, echoed a similar thought I had earlier in the day about the direction I want to focus my paper crafts. He’s interested in woodworking and has a website about it, but he hasn’t done a lot with it. He’s busy building websites for others and with his other websites. But last night he stated he was going to focus on that website more and do more woodworking projects. The parallel for me was from the post I wrote yesterday about the Village Dwelling die cut and all the variations that were possible and how Tim Holtz made other die cuts to change the Village Dwelling into a church or with snow on the roof, also changing it to a surf shack, a manor and a bungalow. My thought earlier in the day was about focusing upon making variations of these village pieces. For example, I was wondering how many different ways I could make the surf shack different . . . different roof, siding, setting . . . decorations for different holidays and seasons . . . Maybe make it into a little market place with a restaurant, fish market, vegetable market, ice cream parlor, antique store . . .
Then, I thought, instead of using the Village Dwelling die cut, I’d use the Village Brownstone, it’s taller and has nice windows on the roof. It seems quite interesting. From the image on the right, it can be changed into a church or school, the roof can be changed . . . and you can always change the siding and remove the windows . . . even change the windows and the shutters . . . You won’t need a die cut for this, just paper scissors and imagination. The Village Brownstone doesn’t have a base, but you can always add one . . . raise it up and make a porch in front with steps . . . you can add a garden to the side . . . or whatever would be appropriate for Halloween . . . could you make it spooky? Have a pumpkin patch in the side yard? Instead of flowers use pumpkins . . . or have a Thanksgiving feast in the side yard . . . Or decorate it for Christmas with trees and snowmen . . . I can see making it into a one room school house . . . or something for Easter with bunnies and Easter eggs . . . Or maybe a fairy tale house with gnomes and woodland critters . . .
I’ve been thinking for quite some time about doing YouTube Tutorials, but never decided upon what I wanted to concentrate upon . . . I’ve always liked making things with a purpose, but cards just aren’t my thing . . . Then I thought about boxes . . . Lots of people are making boxes and designing them . . . Then I thought of these die cut houses and the variations. I’ve always admired the work of Ray O’Bannon of Ravensblight and Ray Keim of Haunted Dimensions . . . And many talented crafters on YouTube who get a die cut and do amazing things . . . I don’t know how amazing I’ll be, but there is something to be said about sitting with die cut pieces in front of you and how you decide to decorate them, assemble them . . . add to them and modify them . . . You can make it wider by adding another piece to it . . . add more windows . . . attach another piece to the side of the Brownstone . . . an addition of some sort . . . a greenhouse, perhaps . . . Anything and just about everything is possible . . . Just dream . . .
You could even do things with gears . . . giving it a Steampunk feel . . . or add wings . . . I was thinking of making a matchbox-type of base for it. This would give you a secret compartment to put some treasures inside . . . or make it larger for a mini-album . . . Those are always popular . 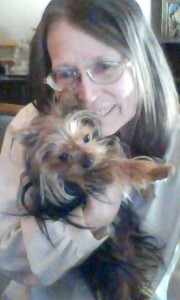 . . We always like to have our loved ones pictures close by . . . Or you could have a story about the origin of the house . . . Who lived there . . . and how it came to be part of your village . . . There is always a story to be told . . . I don’t know how others do it, but I want to give it a try. 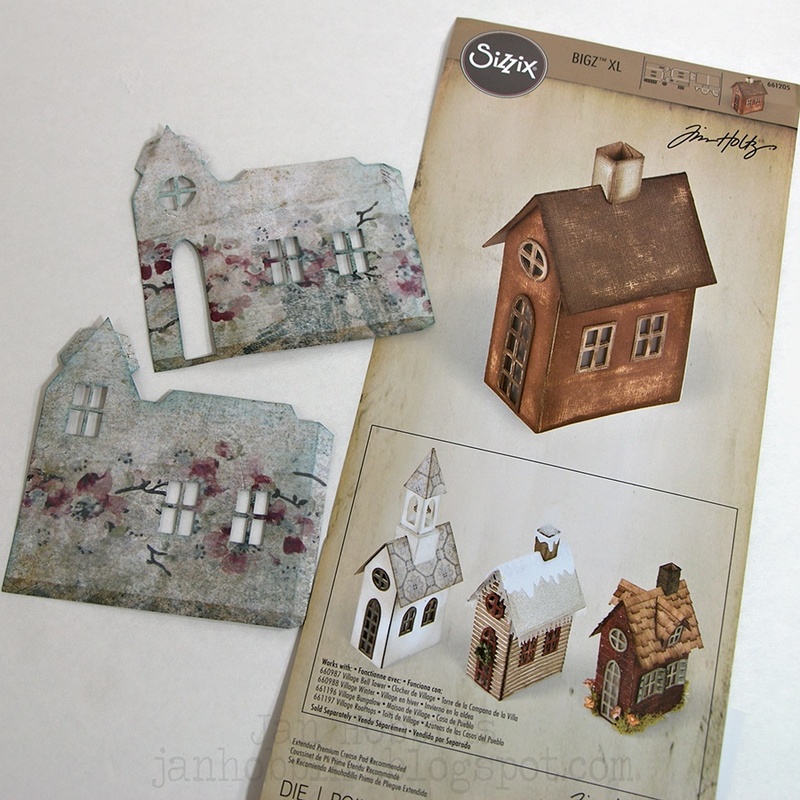 If you’d like to join me in this venture you’ll need a Big Shot or a Vagabond to use these Sizzix dies by Tim Holtz. I thought I’d include some accessories to go along with the Sizzix die cutting machine and the Village Dwelling Die, if you’d like to purchase Tim’s other dies to make the Village Manor, Village Bungalow, Village Surf Shack, Village Winter and The Bell Tower. I think the more dies you have, the more variations you can make. You will need the extended cutting plates and the crease pad for the score lines to imprint on your card stock or chip board.